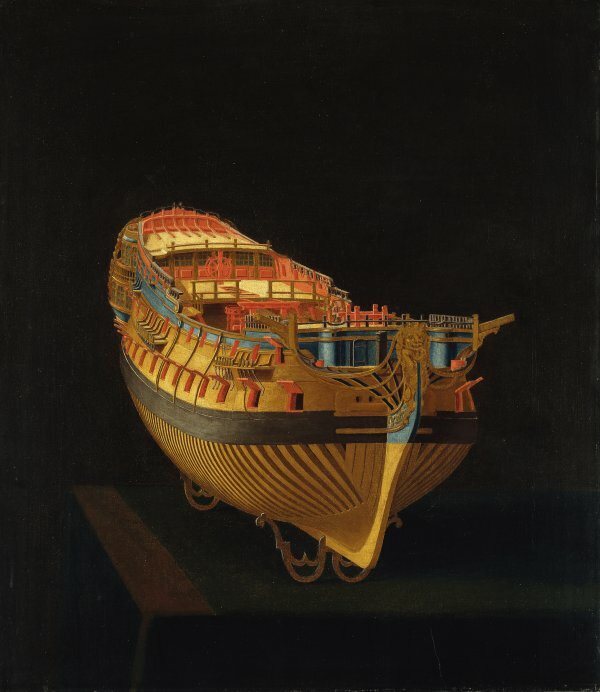 This interesting pair of canvases depicts the model of a ship seen from the stern and bow. The two paintings were acquired from Mallett and Son on the London art market in 1984, the only information available on their history known to date. Such paintings of ship models were part of the construction process of a vessel. These rigorous, technical images were evaluated by the naval authorities and their decision determined whether the vessel would be built. Models and paintings of models allowed experts to detect defects or decide on improvements and also obliged shipbuilders to use the materials specified in the project and to build the vessel as shown. The result was to avoid fraud and modifications to the structure that might make the ship weak and unsafe. From 1649 in Britain it was specified that models had to be made for all ships prior to their construction and be approved by the Admiralty. These models were known in their time as “Admiralty models” while in Spain they were termed “construction or shipyard models”. As can be seen in the present examples, the model shows part of the hull and its woodwork. This allowed for an examination of details such as the keel, timbers, stem and stern-post and other elements below the water level. Also left visible are part of the decks in which the construction and the interior accommodation could be checked. Such details allowed the relevant authorities to check the resistance and strength of the hull, the ship’s navigability in manoeuvres and its behaviour in combat, all with the intention of ensuring its seaworthiness and performance in order to avoid defects that would prevent it from carrying out its intended function. These two technical paintings have dark backgrounds, against which the bright colours of the different parts of the vessel stand out clearly. The model stands on thick plinths on metal stands that allow it to be correctly supported and seen from all sides. The ship has two bridges and sixty-four cannons. The canvas depicting the bow from the starboard allows for an examination of elements such as the stem, keel and timbers, as well as the screen with a door that leads into the accommodation. The figurehead is a lion rampant, which was frequently used by the British Navy at this date. Running along the sides of the ship are two lines of potholes painted in red for the cannons. The view of the rounded stern is less well depicted with regard to its perspective, but offers details of the timbers, transom, rudder-post and rudder. Two red portholes frame the rudder and open into the rudder-hole. Above this area is the double gallery of the stern with a line of closed, glazed windows and above it an open, inset one. This more elaborate part of the vessel housed the quarters of the commander and officers and is adorned at the top by a line of carved cresting. Among the decorative motifs are carved drapes of curtains and military trophies that stand out in ochre against the blue background. These two canvases are a good example of paintings of ship models produced prior to their construction, in this case of ships of the Dublin type.